If you’re a design lover, we’re sure that you’re in Milan! Brera Design District is a reference for the design world, and today a special cocktail party is waiting for you! “When Brera Meets Mid Century” – the event of the events on Brera Design District! It’s just starting and Vintage Industrial Style ‘s Blog will unveil some secrets about what is going to happen! Continue scrolling to see Bredaquaranta Fatebenefratelli looks like! An authentic travel machine ready to take you back to the fifties, and … you can celebrate design with friend, and a cup of champagne! READ ALSO: iSaloni 2019 is ON: Let Us Be Your Inspiration In Milan! For more than 10 years, the chain of showrooms, in Milan, has been one of the most influential one. With a high-end selection of curate design pieces, Bredaquaranta follows every step of its clients’ projects, since the concept, selection of pieces and installation of the previous ones. Bredaquaranta has eleven showrooms spread all over Milan, but we are sure that you’ll want to attend Bredaquaranta Fatebenefratelli, today! If you’re a design lover, we’re sure that you’re in Milan, and, of course, you’ll go to the amazing parties in Brera District. It’s the perfect opportunity to stablish important business relations in a casual environment. Today, this particular showroom is the stage of an amazing cocktail party where special guests will have the opportunity to go back in time to the fities! The party started at 6pm and will be until 11pm. This means it’s plenty of time to see beautiful mid-century pieces from recognized international brands such as DeligthFULL. Some of the most iconic pieces of the mid-century brand is waiting for you at Bredaquaranta’s special cocktail. It’s impossible, for example, to say No, No, No to this invitation! Amy Table Lamp is one of the pieces responsible for the brand’s success, and it was inspired by the one and only, Amy Winehouse. You can see that the shape of the lamp is exactly like her hairstyle and it even has the earring that she usually wore. 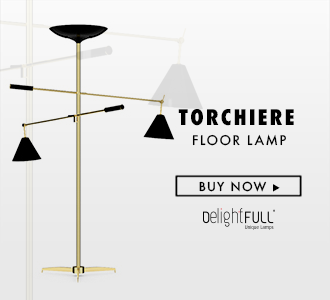 Botti Floor lamp is another lighting piece that is waiting for you. This particular lamp was inspired by Chris Botti, and you’ll feel like you’re in the middle of one of his concerts! Turner Table lamp is a great example of an art déco lighting piece. Inspired by the dynamic, Tina Turner, this table lighting piece is like her: full of movement! With 5 movable arcs, so you can put them into the desire position! Turn Turner table as many times as you want! Sinatra Floor Lamp was the first piece of the brand, and this is the right piece for the occasion! A typical cocktail lighting piece that will create the perfect ambiance to discuss design, and celebrate it with friends! And speaking about celebration! Are you ready to make a toast with us? Matheny Round Suspension will enlighten this special occasion! However if you don’t have the chance to attend the event today, you can see the mid-century pieces in another day at Bredaquaranta! READ ALSO: BREAKING NEWS: HAVE A TOUR ON DELIGHTFULL’S BOOTH AT ISALONI!